A busy afternoon on wednesday for the tourney directors. 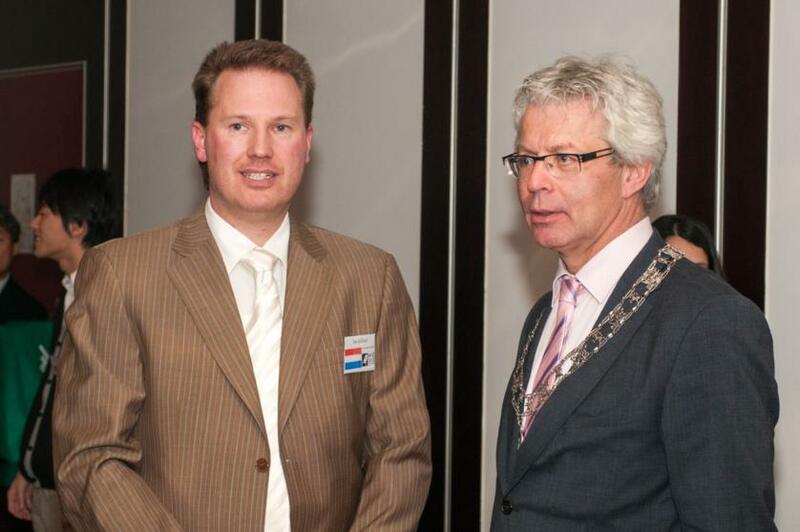 Bauke made sure there are some nice Friesian gifts and leaflets, also thanks to Fryslan Marketing. 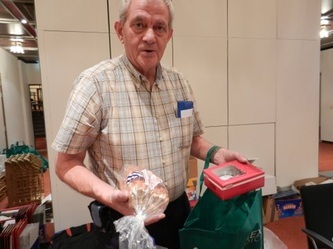 It took 5 people to get all the goodiebags filled. Jan and Marcel and Bengt were busy with all the technical computer stuff. The staff of the Oranje Hotel is most helpful and everything was ready in time for the reception and the official opening. 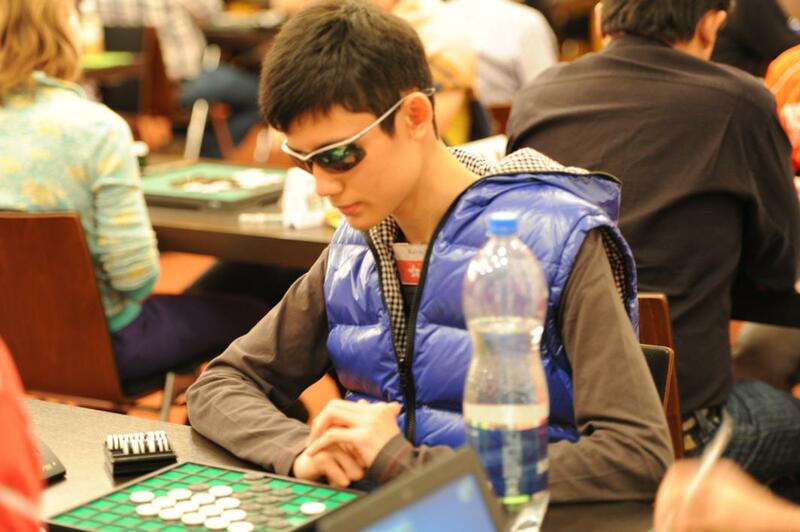 The first player I met in the hotel was Kelvin Yang from Hong Kong. He played at the Köln International last weekend and seemed eager to have anotther go at Matthias Berg. 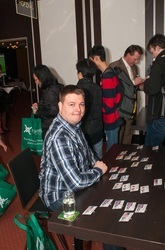 Then the bus arrived from Schiphol Airport and the hotel lobby was filled with othello players. Great fun to finally meet people that I know for years from pictures and tourney results. One of the many interesting games in round 1: Kazuki Okamoto 43 - 21 Michele Borassi on table 3. Michele commented: "What can I say, my opponent just played better. I lost a few discs in midgame. The rest of the game was acceptable". 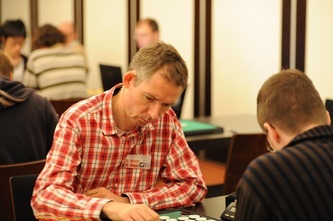 Henrik Vallund played against dutch reserve player Mark van Heere. Mark may be pulled out of the tourney if mr Ouraga shows up before the third round. Henrik played white and there should a be nice stoner trap for you to see. Van Heere 30 - 34 Henrik Vallund. Alejandro Coello 50 - 14 Tomas Douda. Alejandro was very happy with this second win. "I was very concentrated and made few mistakes, I hope I can maintain this level throughout the tourney". 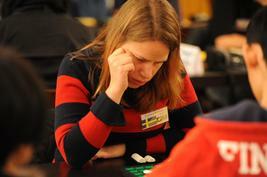 Jiska Helmes was very disapponted about her game against Wachirapan Huraphan 28 - 36. She ran to the computer to analyse her game, wzebra analysis showed her opening went well, at some point in the game she even had a +14 advantage. At table 1: Tom Schotte 28 -36 Seiya Kurita. Table 2: Arnaud Delaunay 21 - 43 Imre Leader. Jeannot Loh Ourega from Ivory Coast arrived after the third round, so the extra player from the organising country, Mark van Heere, was withdrawn. Jeannot managed to get 7 discs in his first game ever at a World Championship. I had a short interview with Jeannot before the start of round 5. He said that though he lost the first game, to him it felt like a victory just be be there. 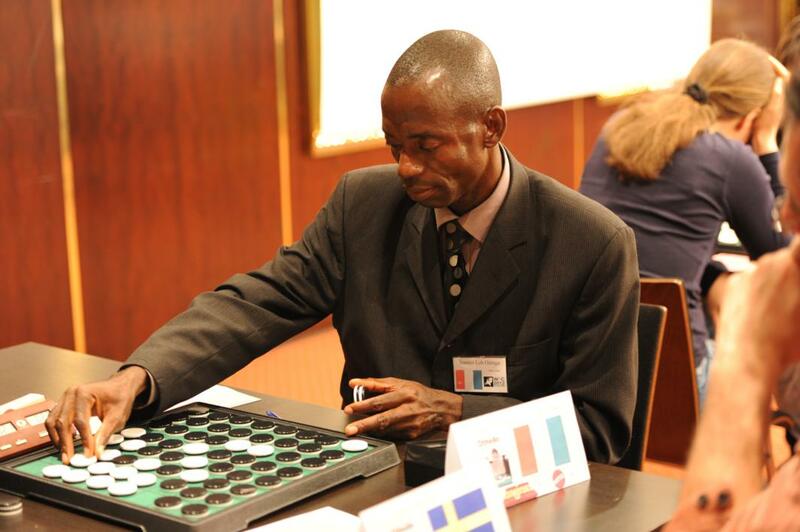 He is really proud to be the first player from the African continent to play at the WOC. He was touched by the warm welcome he received from the president of the WOF and the other officials and players. 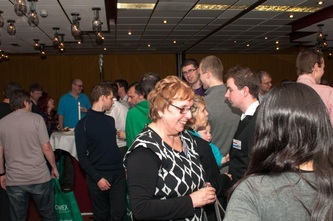 On table 1 there was an exciting game between Nicky van den Biggelaar and Henrik Vallund. The game ended 17 - 47 for Nicky. Four players with 4 points: Yusuke Takanashi, Seiya Kurita, Dominik Nowak and Nicky van den Biggelaar. Best Lady, Linda Praseptyo with 3 points, with wins in the first 3 rounds against Milosz Cupial, Takuji Kashiwabara and Karsten Feldborg. Way to go Linda!!! Two players with 5 points Seiya Kurita and Yusuke Takanashi. Best lady Duangkamol Sokankate with 3.5 points. I talked to Veronica Stenberg about her draw game against Wachiraphan Huraphan. Veronica was quite happy with the result as the player from Thailand has a much higher WOF-rating. Veronica felt quite confident in the opening and that carried her all the way to the end. She had not analyzed the game yet, but she had the impression neither of them had made any major mistakes. Veronica hopes for another win in round 6, she would like to end day 1 with at least 3.5 points. Veronica Stenberg did win her game in the 6th round against Milosz Cupial. So she allready achieved her goal for day 1, maybe she will even win another point in the last round of the day. On table 5 Nicky van den Biggelaar against Michele Borassi. Nicky was at -22 but a bad move #45 by Borassi cost Michele his advantage and move #47 killed his hope for a draw. On table we had the two top japanese players, that was a clear win for Yusuke 46 - 18. So now Yusuke leads with 6 points. Seiya Kurita, Kazuki Okamoto, Nicky van den Biggelaar, Imre Leader, Dominik Nowak and Roberto Sperandio follow with 5 points. Best lady is Jiska Helmes with 4 points. Nice game to watch was Borassi against Caspard, I was referee at that game and really enjoyed to watch this the game. Caspard won 20 - 44. 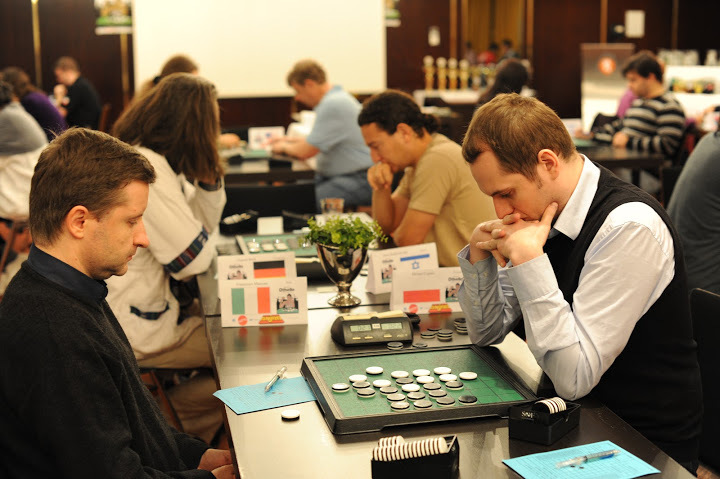 All eyes were on table 1, would Dominik Nowak keep Yusuke from a perfect score? At 12 moves to go Dominik was at -16, no problems for Yusuke and the game ended in 21 - 43. 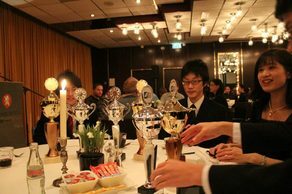 Seiya Kurita and Nicky van den Biggelaar on table 2, won by Nicky 19 - 45. Nicky had the advantage from the start of the game and a few mistakes by his opponent brought him the victory. 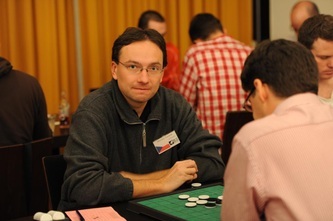 Imre Leader finished the day with a 55 -09 win against Niklas Wettergren. Best 4 at the end of the first day, Yusuke Takanashi 7 points, and 3 players with 6 points, Imre Leader, Nicky van den Biggelaar and Roberto Sperandio. 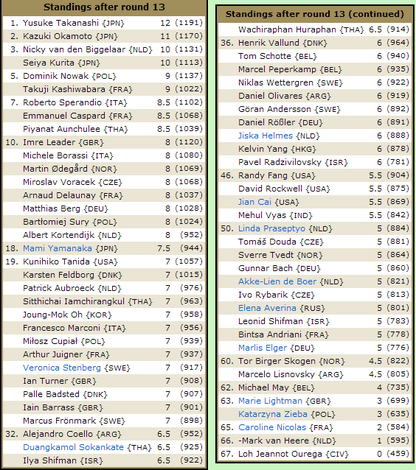 Five "seeded"players made it to the top 15. Piyanat Aunchulee has only 3,5 points, he is a long way from achieving his outstanding result of last year, but everything can change the second day. 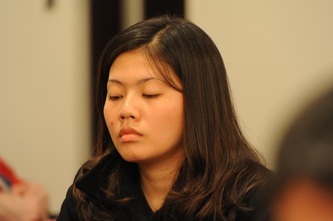 Best lady with 4.5 points and best from the Thailand team is Duangkamol Sokankate from Thailand. At the start of the second day I had a very pleasant interview with the entire Thailand team, Piamrat Kraikokit was kind enough to translate for me. The Thai team is sponsored by Sosuco. They started their trip with a visit to Amsterdam. We Dutch may think that traffic in Amsterdam is busy, but to people from Bangkok it seems quiet like a village. That cars actually stop to let you cross a street.... amazing. And ofcourse so many beautiful buildings to see. The best player of the Thai team after the first day is the female player Duangkamol Sokankate, she has 4.5 points. She told me that in all the games she lost, she had an advantage at some point in the game, but missed the winning moves. One game she was just very lucky, Tom Schotte gave away a +20 advantage. Her best game of the first day was the one against Veronica Stenberg, as she felt she was in control from start to finish. Next with 4 points is Sittichai Iamchirangkul. 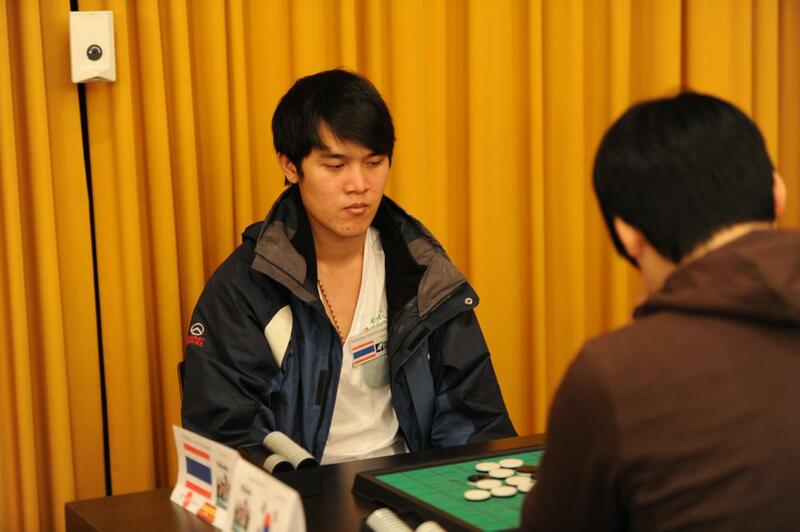 His plans for the second day are to play better than Dunagkamol and to take her place as best Thai player. Lots of giggles in the group, they really seem to be a nice group of friends. Piyanat (3.5 points) knows there is only one thing for him to do today, win all his game. His lost a game in round 6 against Francesco Marconi 33 - 31 because of a mistake in the endgame. Those are the kind of games that can haunt you the next day. 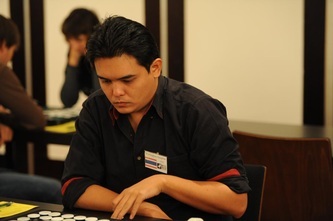 When asked what his best game was in the first seven rounds, Wachiraphan Huraphan said that his draw-game against Veronica Stenberg, was a very interesting game. Another win for Yusuke so he is at 8 points. Number 2 Nicky van den Biggelaar with 7 points, seven players with 6 points. And the team from Thailand? 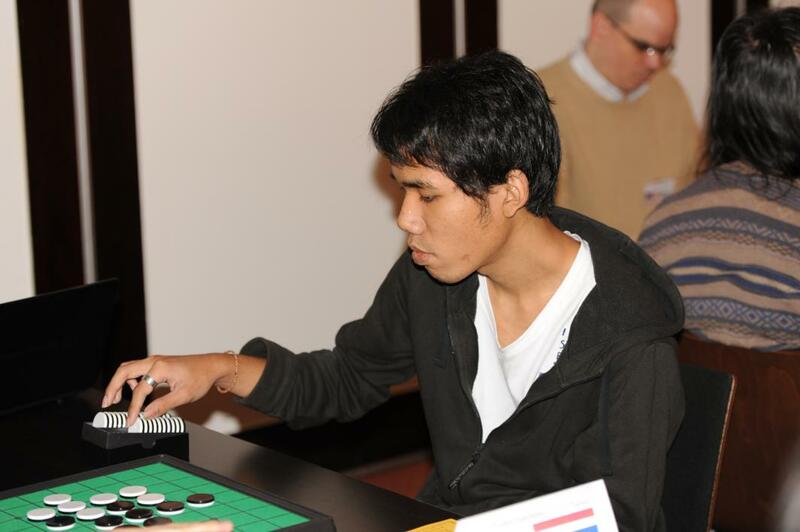 Duangkamol won her game against Göran Andersson 35 - 29, Piyanat played against Wachiraphan and won 22 - 42. Sittichai lost against Matthias Berg 29 - 35. A nice no corner win for Milosz Cupial against Francesco Marconi, 43 - 21. In the coffeeroom I overheard someone say"Who can stop Yusuke"? I don't know, but Yusuke now has 9/9. Yusuke played against Roberto Sperandio and won 24 - 40. Nicky van den Biggelaar 28 - 26 Kazuki Okamoto and Seiya Kurita 47 - 17 Takuji Kashiwabara. Team Japan leads with 23 points, Poland second with 18.5. 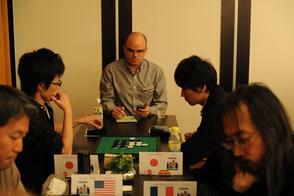 I was referee at table 7, a game between Takuji Kashiwabara and Kunihiko Tanida that took off at full speed. KunihikoTanida took a lot of time to think at midgame and won the game 27 - 37. Takuji was quick and finished with 20 minutes left on the clock.! The games at the top 3 tables all had a 31 - 33 score. 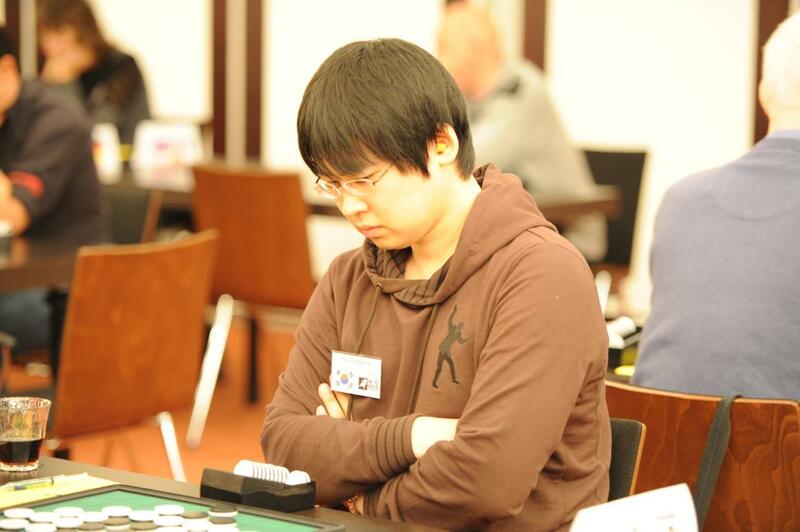 Table 1: Yusuke Takanashi 31-33 Kazuki Okamoto .Who will stop Yusuke? Maybe the answer is Kazuki Okamoto. Yusuki now has 9 points, the other 2 Japanese male players have 8 points. What a team!!! 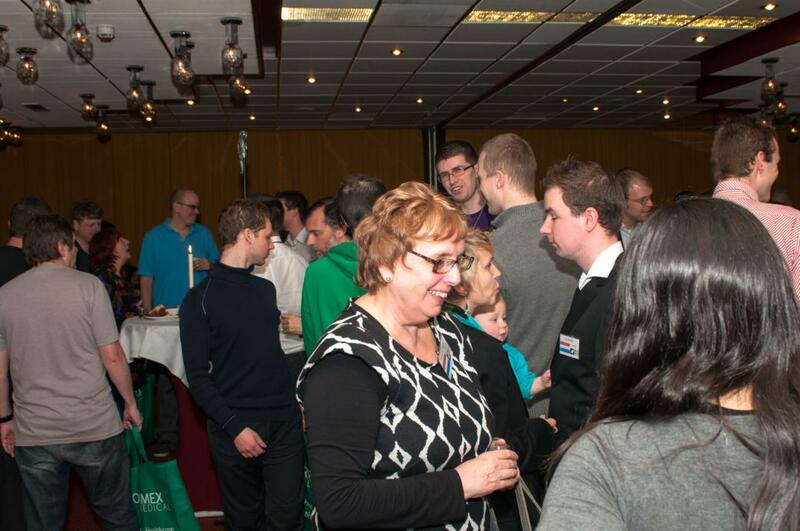 Table 2: Imre Leader 31-33 Nicky van den Biggelaar. Nice game, won by Nicky without any corner. Table 3: Miroslav Voracek 31-33 Seiya Kurita.. Seiya Kuita gave away a lot of his advantage in move 46 but kept a + 2 till the end. Piyanat Aunchulee 31 - 33 Roberto Sperandio. I was referee at that game and becoz of major writing material disfunction (and they opened so fast), I missed the first 10 moves, sorry!! !, but great to see them at work. 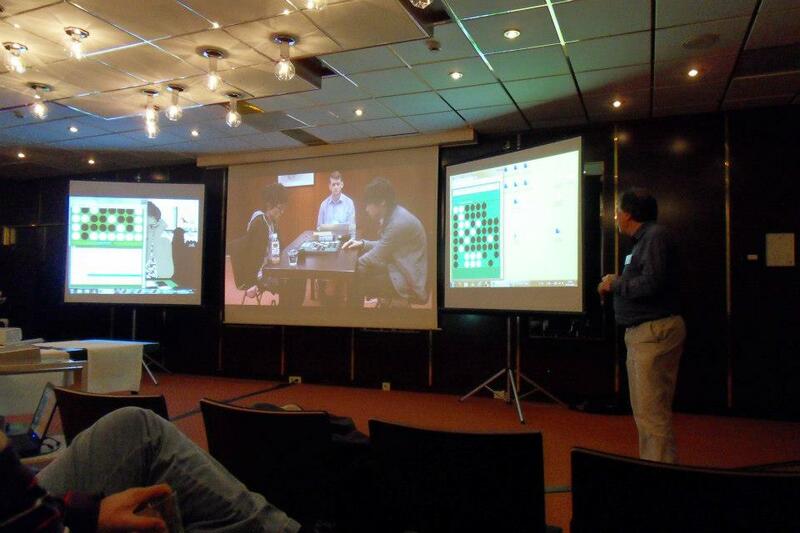 Thanks Stéphane Nicolet and Emmanuel Lazard for reconstructing the game. Top 2 ladiesafter 10 rounds: Duangkamol Sokankate and Mami Yamanaka. Very nice game to referee, Nicky van den Biggelaar 35 - 29 Emmanuel Caspard. Nicky tries to keep up with the Japanese. 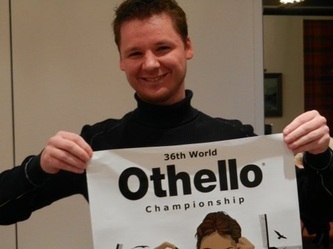 The dutch Othello Federation hopes he will make it to the semifinals. 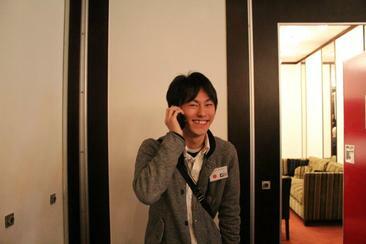 He is in the top 4, together with the 3 Japanese players. 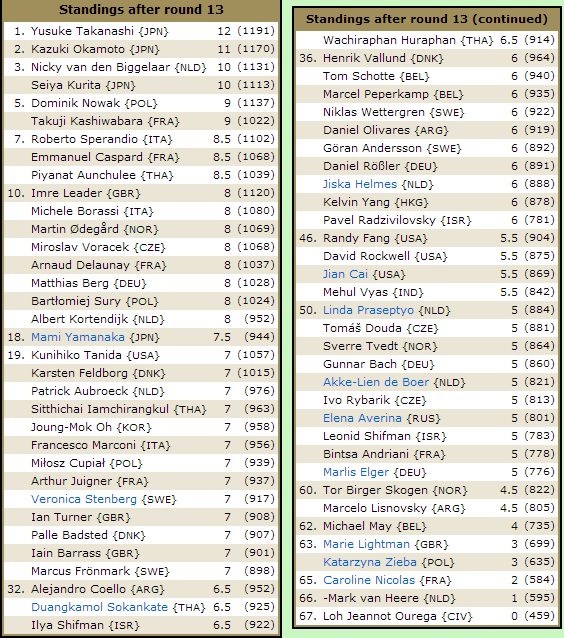 Top 2 ladies: the same as after round 11, but Veronica Stenberg is only half a point behind and the two top ladies will play against each other in round 13. I was referee at the match between Arthur Juigner and Emmanuel Caspard. Arthur was eager to play and could hardly wait to start the clock "Allez jouer!!". The game was a win for Emmanuel 37 - 27. What a fantastic achievement by the young Japanese team, all three players made it to the semifinals: Yusuke Takanashi (age 20), Seiya Kurita (age 15) and Kazuki Okamoto (age 18). 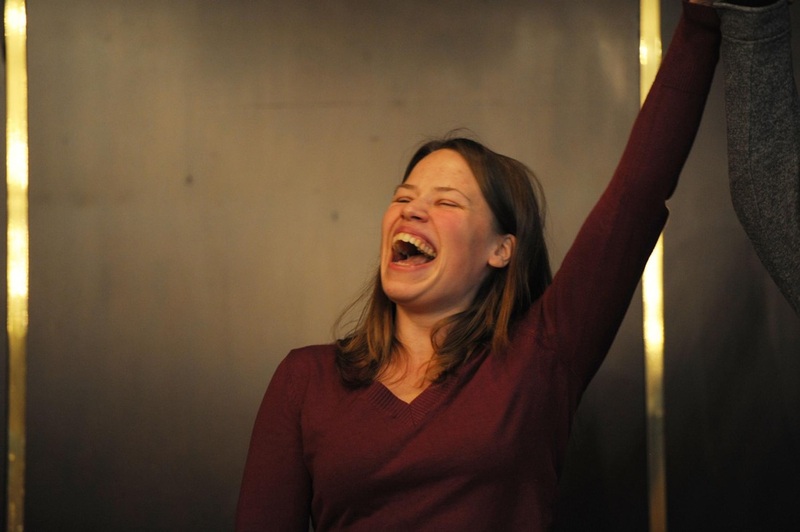 The fourth finalist is Nicky van den Biggelaar from the Netherlands. The Japanese female player Mami Yamanaka will play in the ladies final as she won her game against Duangkamol Sokankate 37 - 27. Mami Yamanaka had only 2.5 points at the end of the first day, but really showed all her skills on the second day. The other ladies finalist is Veronica Stenberg from Sweden who won her last game 36 - 28 against Daniel Rossler. The Japanese team is team-winner for the 8th time in a row. Japan has 33 points, second is France 25.5 points, third the Netherlands 25 points. 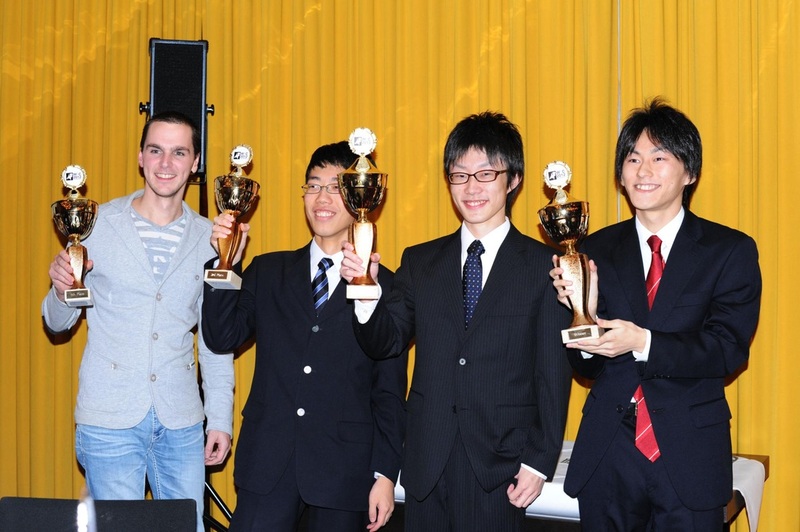 The Japanese team: Yusuke Takanashi (12 points), Kazuki Okamoto (11 points) and Seiya Kurita (10 points). 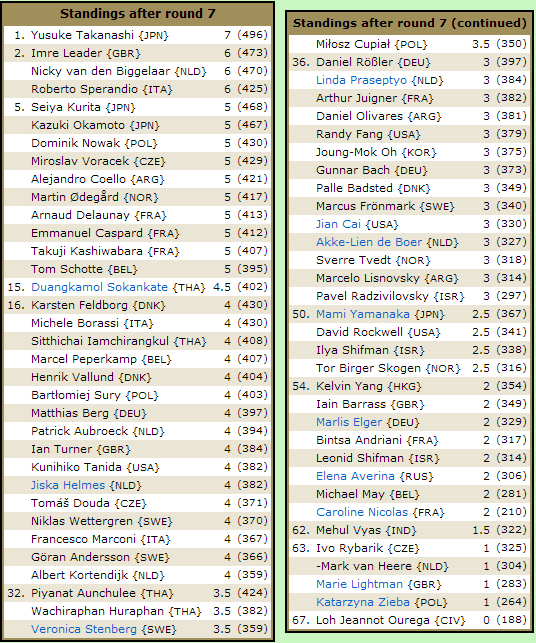 Team Netherlands: Nicky van den Biggelaar (10 points), Albert Kortendijk (8 points) and Patrick Aubroeck (7points). Nicky made it to the semifinals, just like last year, but this time he lost. The three Japanese players took 1st, 2nd AND 3rd place!!! It was an exciting match and great fun to watch. After the 13th and last round Veronica was second best lady with 7 points (overall ranking 19th. Mami Yamanaka had 7.5 points and ranked 18th. A very good second day for Veronica and the best was yet to come! Veronica Stenberg, 3 times WOC Ladies finalist and this time...... SHE IS THE WINNER!!!!!!!!! 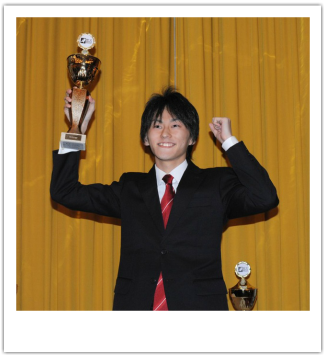 Yusuke Takanashi wins his third World Championship, what a great achievement! This was the second time that two players from the same team met in the finals: in 2001 the two finalists were Brian Rose and Raphael Schreiber, both playing for the USA. The Japanese team won first, second, and third place. They also won the team trophy and Ladies 2nd place, No team ever did this before in the 36 year history of the WOC. Team Japan looked very smart in their dark suits and when they raised up their trophies, everyone in the room was happy for them and proud to have witnessed their victory. 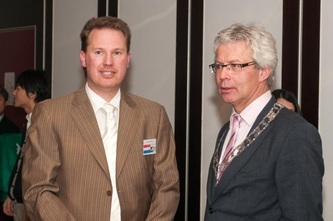 I am also very proud of Nicky van den Biggelaar. When I first met him at tourneys in the Netherlands, he was just a kid. but a very smart one. And over the years he has improved his game. This year he was the only European player to make it to the semi- finals. Well done Nicky!! 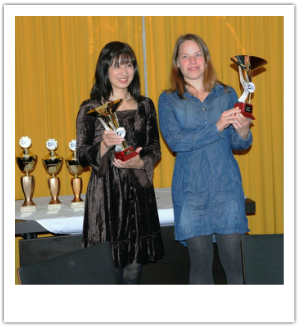 Veronica Stenberg and Mami Yamanaka have both been runner-up at the WOC (f) before and after an exciting final, Veronica brought the ladies trophy back to Europe. The ladies both played a great tourney, fighting their way to the top on the second day. It was a great championship and I was so happy to meet you all. I allready knew most of you by name and face, from tourney results and pictures. Now the pictures came to life and it was wonderful to get to talk to you and to see you play this wonderful game that we all love. 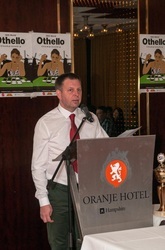 Thanks to all players, to our sponsor Anjar, the tourneydirectors and to all those who helped to make this event a succes.